I’m sure we all hear about unit testing, test driven development and so on. These practices are useful and provide a long list of benefit like writing low-coupled and mantainable code to name a few. We want to write unit test for our UWP Prism application and we’d like, for example, to put our ViewModels under tests to make sure the logic they implement is correct. Unit testing is possible only if we can get rid of all the dependencies in our class under test because we want to run our test every time we want (for exemple when the service library our teammate is writing is not yet finished) and as fast as we can. But this is not a problem. Since we developed our UWP app with Prism we can leverage the Dependency Injection pattern for our testing purpose. We’re going to create mock/stubs istances of the services needed by our viewmodels and test the inner logic of the methods. Creating manual mocks/stubs is error-prone and time-consuming so we need a mocking framework. In the UWP world we have little choice and we’ll use SimpleStubs. SimpleStubs is mantained by Microsoft Big Park Studios and it’s available as a NuGet package. 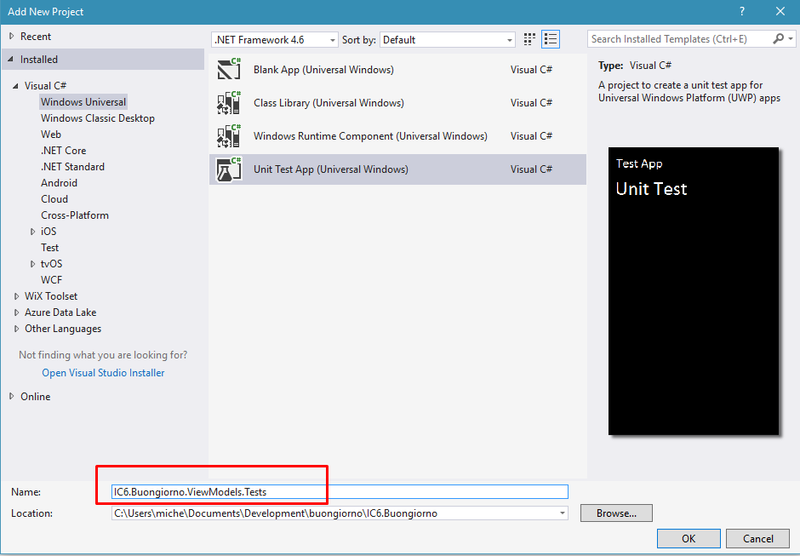 Unit testing in the UWP world has some limitations. The first one is that you cannot test App but only libraries. The second one is that testing takes place inside an App that hosts the testing engine. This can be an issue if we think about headless processes like continuous integration and test run automation. Right click on the solution in the Solution Explorer and we select Add –> New Project… . We select Unit Test App and we give a meaningful name. 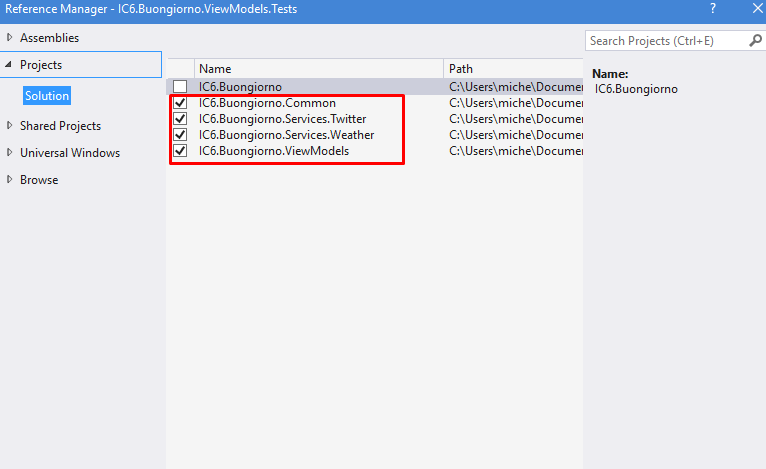 In this example we write IC6.Buongiorno.ViewModels.Tests. This name states that we’re working in the context of ViewModels and we’re going to put in this assembly tests about ViewModels. As usual with Manage NuGet packages we search for SimpleStubs and download in the test project. 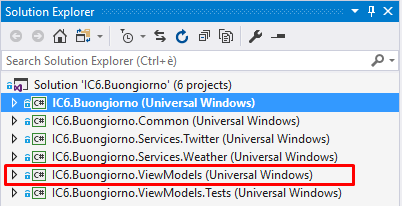 In our example in the IC6.Buongiorno.ViewModels.Tests project. The majority of mocking framework we know in the .Net classic framwork isn’t available for UWP because they use dynamic code generation which is limited in UWP. So SimpleStubs creates the mocks when building. Another limitaion prevents him from adding the file that contains the classes automatically so we need to create it manually the first time. The file SimpleStubs.generated.cs is located in the directory Properties. To add it, in solution Explorer we right-click on Properties, Add, New Item and we create a new Class named SimpleStubs.generated.cs. Don’t worry about the content of the file: it will be completely overwritten by SimpleStubs at compile time. As we can see the StubITwitterService we created has a more complex syntax. With that line of code we’re setting a customized behavior for the GetTimeLineAsync method and we are setting that it has to return the fakeTimeline we setup the two line of codes above The other stubs are simply placeholders and they won’t do anything so our code in the Update method will run smoothly. In the assert section we expect the timeline to contain the text decided in the setup section. We click Run All in the test Explorer and we can see the test passing. In this blog post we’ve experimented a bit with unit testing in the UWP Prism app world. We’ve had to find some workarounds for the UWP limitations and to write manually some stubs. In the end we’ve written our unit test and run it successfully.